Lina Spies was was born on 6 March 1939 in Harrismith, Orange Free State, where she attended school. Her father, J. F. Spies, an author of children's verses and school anthems, was headmaster of the Primary School. When she was three years old, the family moved to Stellenbosch, where her father wanted to continue his studies. 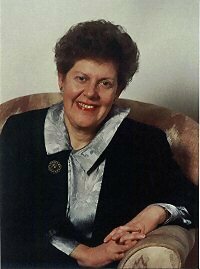 Lina studied at Stellenbosch University and obtained a Masters degree with a thesis on the poet Elisabeth Eybers in 1963 ( Die bewerende en beeldende vers in die poësie van Elisabeth Eybers). From 1968 - 1970 she studied Netherlandics at the Free University of Amsterdam, completing a Masters degree (Drs. Lit.) with a thesis on Nijhoff and his sonnet cyclus, Voor dag en dauw. In March 1982 she obtained a D Litt at the University of Pretoria, with a thesis on D. J. Opperman (Weefsel en web: Heilige beeste, Negester oor Ninevé en Komas uit 'n bamboesstok van DJ Opperman binne die verband van sy oeuvre. Promoter: A.P. Grové). Lina Spies lectured at the Universities of Port Elizabeth, Stellenbosch and Pretoria. She was Professor in the Department of Afrikaans and Dutch at Stellenbosch University from 1987 to 1999. In March 2006 she was elected a member of the Stellenbosch University Council. Hobbies: Music and - "I love all animals. 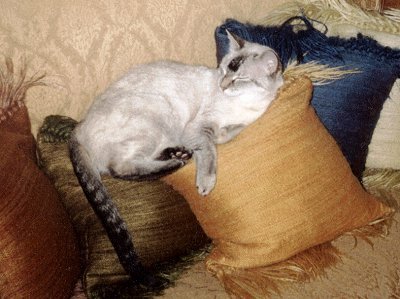 But I ADORE cats. 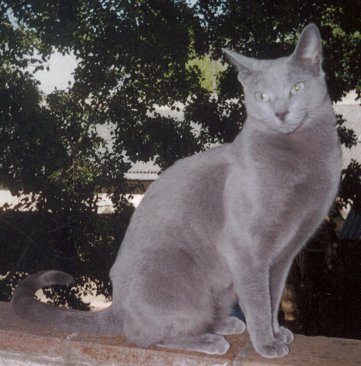 I have two: Toesj, an Abyssinian and Siamese cross and Tonya, a Russian Blue." Quote: Indeed, poetry has taught me to master myself, pull myself together, see things clearly; poetry has made something of me, in the most practical sense of the term. Maar wat sal jy van my kan saamneem? Ontydige loseerder, wat soek jy hier by my? Weg, jy met jou strandhuisslordigheid! en kyk vir my uit n gebarste spieël. waar n visstert en reënboogvinne was. soos die golwe se dreuning in n skulp. Gaan eet vrot visse op die strand. Kyk, ek gee jou vir die see present.